Why We Need Playground Sun Shade? Summers in the U.S. offer tremendous opportunities to the people to spend time outdoors after extreme snowy winters. Kids and adults prefer to sit outside and enjoy the sunlight. For kids, outdoor play is extremely beneficial for their physical development. However, the excess of sunlight can be dangerous for them. Prolonged exposure to ultraviolet rays and high temperature from the sunlight can result in serious health and skin complications. Sweating under the sun not only causes dehydration but may also lead to lifelong skin deformation. So should we ban our kids from playing outdoors? No, but the parents and caregivers must take necessary actions to protect the children from play-related dangers associated with outside play. Investing in high-grade and durable playground sun shade will offer adequate protection from the harmful effects of sunlight. Not only children but adults can also rest under the shade structure while supervising the kids. A playground sun shade is an ideal shelter place to counter the temperature from sunlight and protect parks and school playgrounds. 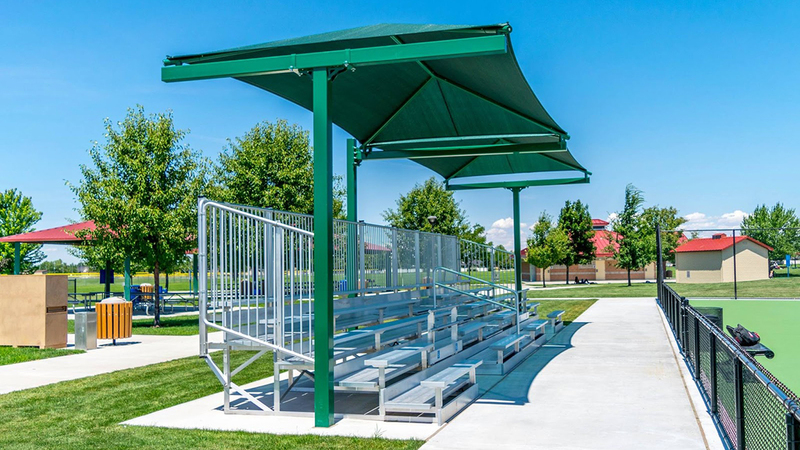 Shade structures with larger size are not only sturdy but also provide effective protection for both adults and the kids. Our fabric shade structures are suitable for kids of all ages as they act as sun blockers for them. Install them over the sandboxes for toddlers or over the larger playground equipment. Shade structures also keep the children away from injuries. They act as a heat repellent and try to keep the playground equipment cool. 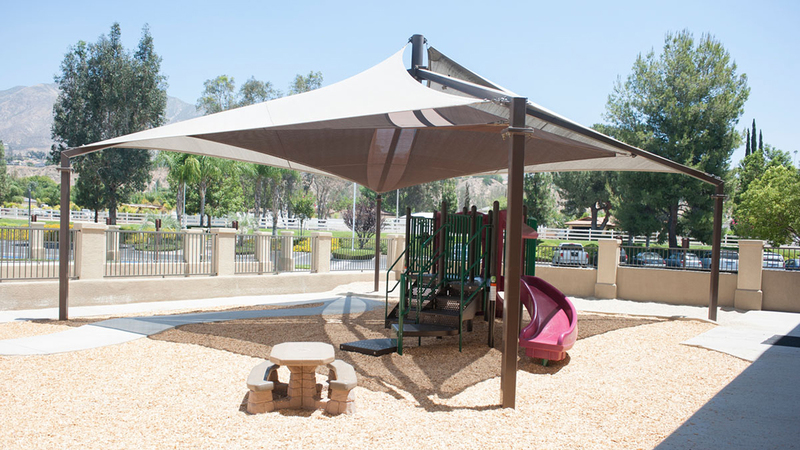 Rectoday’s playground shade structures have been carefully designed to protect from the sunlight. The angles of these shades are designed in such a way that everyone is guarded against the direct sunlight and heat. We have a wide range of commercial sun shades with varying designs and structures. This is helpful in choosing the coverage and durability of your choice. This variety also gives you the choice of looks and function that you want to give your space. 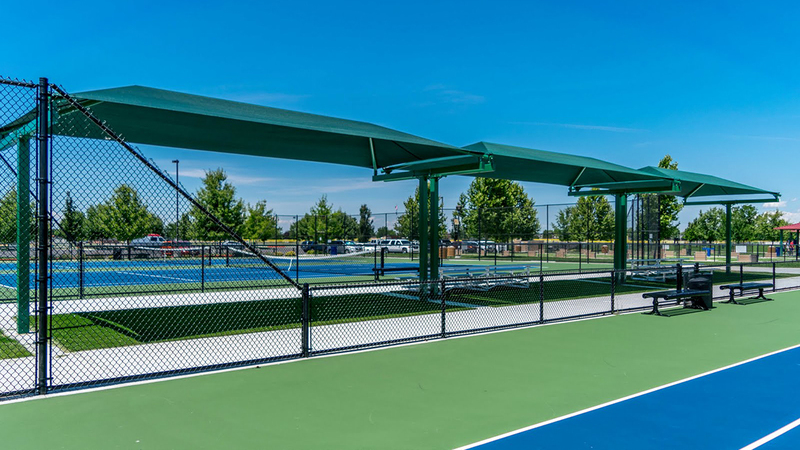 For example, to protect larger playground equipment at community parks, commercial shade structure made of steel can provide better coverage and durability to fight hard weather elements for many years. Children and adults are more likely to spend time outdoors for a longer period because they have a cooler place to sit in. Outdoor sun shades will encourage kids to play for longer periods due to cool shade. Families can picnic for longer times and friends and stick around longer when they are comfortable. Commercial sun shade is not solely meant to protect children and adults. They protect whatever is underneath them. These can be used in outdoor restaurants, car parking, home lawns, and in schools. Outdoor shade structures can be easily integrated into an organization’s theme and setting. The choice of colors and material can help an organization exude their values. 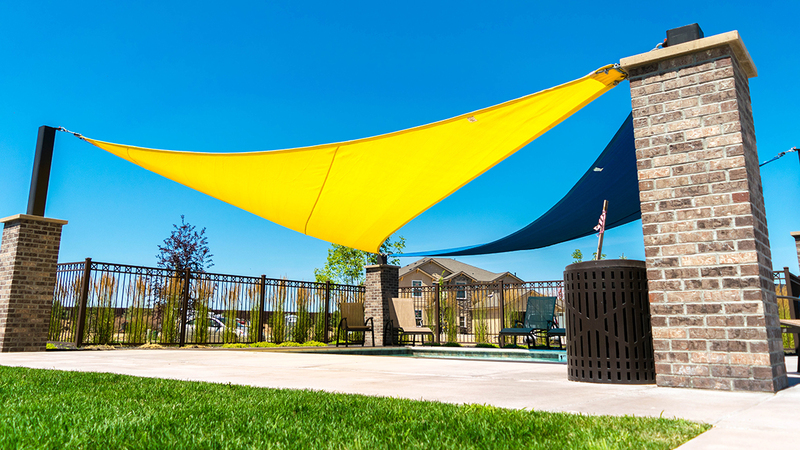 Rectoday’s shade structures are available in various geometric shapes that can fit a space with unique topography. We have pool shade structures as well as sun shades for school playgrounds. So choose whatever you like from our wide range of commercial sun shades. We offer the most affordable outdoor sun shades in the market. If you are interested, contact us now for a free quote. Our customer representative will help you all the way to select the right shade structure for your school, business, or organization.